Khoshkhoo, B., Mohammadi Motamed, S., Hamzeloo-Moghadam, M. (2017). Datura innoxia anti-angiogenesis properties. Research Journal of Pharmacognosy, 4(2), 39-44. B. Khoshkhoo; S. Mohammadi Motamed; M. Hamzeloo-Moghadam. "Datura innoxia anti-angiogenesis properties". Research Journal of Pharmacognosy, 4, 2, 2017, 39-44. Khoshkhoo, B., Mohammadi Motamed, S., Hamzeloo-Moghadam, M. (2017). 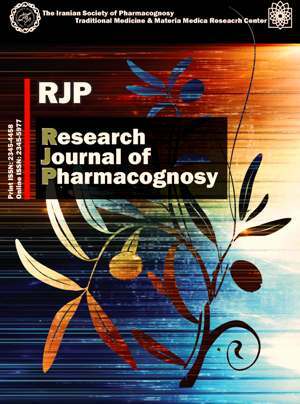 'Datura innoxia anti-angiogenesis properties', Research Journal of Pharmacognosy, 4(2), pp. 39-44. Khoshkhoo, B., Mohammadi Motamed, S., Hamzeloo-Moghadam, M. Datura innoxia anti-angiogenesis properties. Research Journal of Pharmacognosy, 2017; 4(2): 39-44. 1Department of Pharmacognosy, Faculty of Pharmacy, Pharmaceutical Sciences Branch, Islamic Azad University, Tehran, Iran (IAUPS). Herbal Medicine Research Center, Pharmaceutical Sciences Branch, Islamic Azad University, Tehran, Iran (HMRC). 2Department of Pharmacognosy, Faculty of Pharmacy, Pharmaceutical Sciences Branch, Islamic Azad University, Tehran, Iran (IAUPS). 3Traditional Medicine and Materia Medica Research Center and Department of Traditional Pharmacy, School of Traditional Medicine, Shahid Beheshti University of Medical Sciences, Tehran, Iran. Background and objectives: Datura innoxiaMilleris one of the two species of Datura (Solanaceae) which grow in Iran. There are many reports of the biological activities of Datura and in the present study the ability of Datura innoxia for inhibiting angiogenesis was evaluated. Methods: The methanol extract and petroleum ether, chloroform and methanol fractions of Datura innoxia flowers were obtained by maceration method. The extract and fractions were further evaluated for their cytotoxicity and anti-angiogenesis properties in HUV-EC-C cells through MTT and wound healing assays, respectively. Results: The methanol extract and the petroleum ether, chloroform and methanol fractions were cytotoxic to HUV-EC-C cells (IC50 11.25, 63.3, 8.75 and 9.27 μg/mL, respectively). The chloroform fraction demonstrated the most anti-angiogenesis activity in the wound healing assay. Conclusion: Evaluating the above activities of the compounds isolated from Datura innoxia might be a proper follow up of the present study. Pandey M, Saraswati S, Agrawal SS. Antiproliferative effects of Datura innoxia extract in cervical HeLa cell line. J Pharm Res. 2011; 4(4): 1124-1126. Manske RHF. The alkaloids chemistry and physiology. New York: Academic Press Inc. Publishers, 1995. Fattorusso E, Taglialatela-Scafati O. Modern alkaloids structure, isolation, synthesis and biology. Weinheim: WILEY-VCH, 2008. Christen P. Tropane alkaloids: old drugs used in modern medicine.In: Studies in natural products chemistry. Atta-ur-Rahman, Ed. Amsterdam: Elsevier, 2000. Kim N, Estrada O, Chavez B, Stewart C, Auria JCD. Tropane and granatane alkaloid biosynthesis: a systematic analysis. Molecules. 2016; Article ID 21111510. Mozaffarian V. Dictionary of Iranian plant names. Tehran: Farhang-e-Moaaser, 2007. Hamzeloo-Moghadam M, Firouzi J, Saeidnia S, Hajimehdipoor H, Jamili S, Rustaiyan A, Gohari AR. Cytotoxic hydroperoxy sterol from the brown alga, Nizamuddinia zanardinii. Daru J Pharm Sci. 2013; 21:1-4. Hamzeloo-Moghadam M, Naghibi F, Atoofi A, Asgharian-Rezaie M, Irani M, Mosaddegh M. Cytotoxic activity and apoptosis induction by gaillardin. Z. Naturforsch C. 2013; 68(3-4):108-112. Mosaddegh M, Esmaeili S, Eslami-Tehrani B, Kermatian B, Mohebby S, Hamzeloo-Moghadam M. Anti-angiogenesis properties of Crocus pallasii subsp. haussknechtii, a popular ethnic food. Res J Pharmacogn. 2015; 2(3): 37-42. Fatima H, Khan K, Zia M, Ur-Rehman T, Mirza B, Haq I. Extraction optimization of medicinally important metabolites from Datura innoxia Mill. : an in vitro biological and phytochemical investigation. BMC Complement Altern Med. 2015; 15: 1-18. Arulvasu C, Babu G, Manikandan R, Srinivasan P, Sellamuthu S, Prabhu D, Dinesh D. Anti-cancer effect of Datura innoxia P.mill. leaf extract in vitro through induction of apoptosis in human colon adenocarcinoma and larynx cancer cell lines. J Pharm Res. 2010; 3(7): 1485-1488. Singh R, Nawale L, Sarkar D, Suresh CG. Two chitotriose-specific lectins show anti-angiogenesis, induces caspase-9-mediated apoptosis and early arrest of pancreatic tumor cell cycle. Plos One. 2016; Article ID 0146110. Maheshwari NO, Khan A, Chopade BA. Rediscovering the medicinal properties of Datura sp. : a review. J Med Plants Res. 2013; 7(39): 2885-2897. El Bazaoui A, Bellimam MA, Soulaymani A. Tropane alkaloids of Datura innoxia from Morocco. Z Naturforsch C. 2012; 67(1-2): 8-14. Witte L, Müller K, Arfmann HA. Investigation of the alkaloid pattern of Datura innoxia plants by capillary gas-liquid-chromatography-mass spectrometry. Planta Med. 1987; 53(2): 192-197.